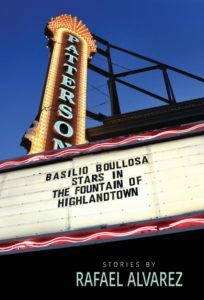 The collection of short stories by Rafael Alvarez, Basilio Boullosa Stars in the Fountain of Highlandtown, is a sort of update to the author’s canon. The book is named for the story at its center, which is the original gem from a previous collection about Baltimore (The Fountain of Highlandtown), whose other stories the author essentially renounces in his Forward. The author’s chosen time and place are an interesting case of the great hangover that American cities experienced after the rush of the post-WWII economic boom. This case concerns an east coast, port city that sits just off the mouth of one of those characteristically wide, Tidewater rivers. This is the principal city of that grand estuary called the Chesapeake that allows anyone to precisely locate our odd, little state of Maryland on the crudest map or smallest globe. As in many cities, the story was enacted where the second generation saw the icons of the first generation’s prosperity dismantled. The factories closed down while the communities that surrounded them persisted. Basilio Boullosa’s city thrived on steel manufacturing and lived to see its decline. but these stories are a different kind of testimony. They effectively convey the experiences of Basilio’s community, but they are from a young baby boomer’s perspective. It’s a little different than the familiar small-town-in-decline stories with which I grew up. 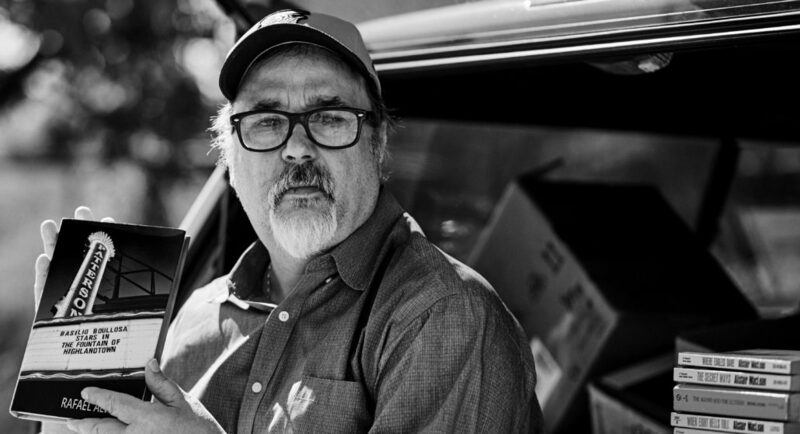 It’s an immigrant neighborhood whose younger generation scatters away from it, all except Basilio, who returns to it from the county and won’t let go. This is a refreshing perspective on a topic that gets a lot of treatment because it deserves so much. Paying tribute to the 20th Century’s rise by narrating its fall is a tradition that Alvarez is well-suited to honor. The life of Basilio Boullosa is a realm of memory. This life is laid bare for us in these stories. Basilio is living with Grandpop, an old Spaniard, in the house on Macon Street. With some memories of his childhood as the exception, we only see his life post-divorce, whether it’s from his perspective or one of the other Holy Land denizens. It is interesting to note that only in the title story does the author share Basilio’s perspective in the first-person. He shares other first-person perspectives with us, each with its own vantage point of the Holy Land and of Basilio, but The Fountain of Highlandtown is the center of gravity that draws all of these other tales together. Perhaps the author can stand to bare his fictional counterpart’s thoughts directly here because he goes to such sincere effort to portray two other voices: Grandpop, and the Johns Hopkins doctor named Katherine who decides to let the odd painter she met at the market take her on a date. Although this book is not a novel, it accomplishes for Basilio and the Holy Land what a novel could, but with a degree of freedom that the novelist doesn’t necessarily enjoy. Katherine is a strong enough character to have determined the arc of the entire book, but the story-writer is not obligated to repeat his cast of characters. Some tales meander through memories as though they had willed themselves into a form that would be included in this time capsule. Other stories, such as “Nine Innings in Baltimore,” are highly-organized and crucial to the arc of Basilio’s life. We see the cleverness of the writer from the beginning. He doesn’t show us Basilio the divorcé right away. He begins by showing us a lonely fellow called Wigmann, whose life touches that of young Basilio back when Grandpop was not so grouchy. Alvarez has a green thumb for planting single seeds in the places where they must grow. We learn here that, no matter what, Grandpop loves Basilio. A critic could almost wonder what the point of Wigmann is, since we don’t get a feel for him so much as an outline, but the outline is adequate to house the foreshadowing of what Basilio’s woes will one day be. It’s almost too much – the first story of the anthology has us waist-deep in characters and their pasts and their feelings. “Orlo remembered when he was Wigmann’s age, it was the year Leini got married, a year into their affair. He’d sat brooding on the roof of the Salvage House as his lover’s wedding guests danced in a circle behind Ralph’s Diner.” But this crowd of details has charm not unlike the charm of Miss Bonnie’s bar, stacked up to the rafters with Elvis memorabilia, including a “one-hundred-gallon home of a submerged Graceland and three generations of Holy Rosary Spring Carnival goldfish floating in and out of the mansion’s empty rooms, the path to the King’s front door paved with bands of gold.” Alvarez’s fiction functions in this way. It simmers with memory continuously, like Orlo’s “cauldron of trotters.” At the end of Wigmann’s story, we see the intersection of the two characters that reveals why Wigmann’s story has to be included. The reader can’t help but feel set up for a punchline. A continual point of interest for the reviewer is Basilio’s portrayal as a painter. One cannot help but wonder about process when an author is writing autofiction. One wonders what is autobiographical and what is ficto-nautical. A reference to felt-tip Faber-Castels is appreciated, and the notion of the narrator, whose voice we know from the hearing Aunt Lola on the radio, as having earned his Christmas money painting crabs on the sides of trucks is positively adorable, but writing a character who is an artist is a formidable feat. I had to wonder at least a bit how much the author might actually draw. Even if he never painted a blue crab, perhaps he found himself “sketching the altar linens” at his own mother’s funeral. It is a meaningful image. I spent the earlier section of this anthology wondering about how convincing a painter Basilio was, all the way until the moment Basilio described his attempt to paint Bolewicki’s clock. “I couldn’t get the water right, I couldn’t make it look like it was really bubbling.” It was not a moment too soon. The moment Basilio the painter is granted at the end of the title story is significant and well-earned, and clearly serves as an impetus to the formation of all the other stories around this one. Every exploration the author makes is a chance to adorn the narrative with a profundity of detail and history. “Nine Innings in Baltimore” comes in the collection’s second half, and it features a moment when Basilio is greatly troubled, having already “banged the heavy receiver of Grandpop’s rotary phone – black steel and Bakelite, Eastern 7-5254 – against the kitchen wall, chipping the plaster…” He is out, pounding the pavement in a desperate state, but still, the author can’t help but perceive history at every angle. “Basilio veered off the tracks, passed the ruins of the Standard Oil refinery (back in the 1940s, his mother’s grandfather had lost a foot there), and scuffled through the side streets and alleys toward Miss Bonnie’s bar on the edge of the gentrified harbor.” This setting is saturated with its time and place. This story is carefully structured across the nine innings of an Orioles game that Basilio doesn’t quite attend. Careful, writerly choices are made possible by this that allow Alvarez to set the reader up yet again for a patiently delivered punchline that turns out to ripple throughout the rest of the book. At the same time, the reviewer couldn’t help but feel that a well-ordered structure wasn’t all that was necessary. The miasmic, frenetic meandering that is the story of “Basilio and Grandpop and Nieves” comes just before “Nine Innings” and serves as its nonsensical opposite. If Basilio’s identity as a painter is fueled by the author’s head full of pictures, then the “Nieves” story is from the place those pictures go to swirl and storm around in the author’s head, less a memory of Highlandtown and more a fever dream of a “familiar cloven hoof hard on the pedal from the moment he met her at the storm door embossed with an aluminum ‘B.’” A consequential tale like “Nine Innings” could only function properly with a broad emotional basis for it established. Perhaps only an inexplicable chaos like the “Nieves” story could supply that. All spoilers aside, the second half of the anthology follows the further growth of this human being called Basilio Boullosa, whose life does not take place exclusively within the boundaries of the Holy Land. Timewise, we are with him through the demolition of Memorial Stadium, the old home of the Baltimore Orioles. His life is our time capsule, having captured so much soul and character from the city he loves. The 21st Century is distinguishing itself according to values not held precious by all would-be ambassadors of the past. Alvarez makes for a conscientious storyteller. He doesn’t go so far as to address the segregation of the times, but the charm of his tales and the triumphs of his characters in no way depend on exclusion or disparagement of other races, creeds, or nationalities. The author seems to bare his heart without betraying any ugly prejudices. Inasmuch as a male reviewer may comment on a male author’s representation of women, Alvarez appears to hold himself to a standard of respect. It seems relevant to mention, because current times have seen sexist behaviors that were once commonplace and accepted called out and summarily rejected, to the extent that they take on a sort of musty odor, an old century-ness that can no longer serve. Of course, the 20th Century was still grand, and full of poetic history – it simply required capable, 21st Century ambassadors to share its treasures.